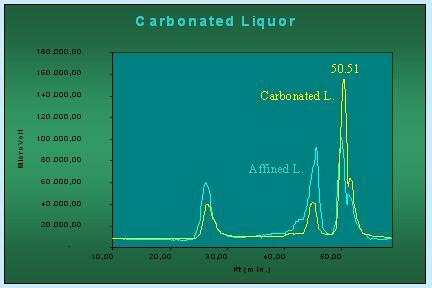 During Carbonatation there is a substancial reduction of affination liquor colour (40 - 50%). Colourants that have acidic nature can form weak bonds with calcium and will be incorporated in the calcium carbonate precipitate during growing (Davis, 2001). Kennedy and P. Smith, 1976, refer that polar polymeric colourants, with amino nitrogen and anionic at high pH, have high affinity to the calcium carbonate precipitate. Compounds of molecular weight between 12 kDa and 50 kDa, including melanoidins, are substantially removed (Figure ) (Bento and Sá, 1998). Compounds of very high molecular weight, higher than 250 kDa, suffer a reduction of 8% (Table Figure). Due to browning products hydrolysis, single phenols are released to carbonatation liquor. Kennedy and P. Smith, 1976, refer that carbonatation removes few cane pigments of low molecular weight. Farber, et al, 1968, refer that flavonoids are not well removed by Carbonatation, although those derived from tricine are preferentially removed (P. Smith and Paton, 1985). Due to the high alkalinity observed during Carbonatation, a hydrolysis of phenolic acids esterified to polysaccharides can occur. Due to this hydrolysis, the phenolic part, coloured, or their oxidation products, will be separated from the carbohydrates, and therefore, its affinity to sugar crystals decreases. This fact can explain that sugars crystallized from liquors, with equivalent quality, obtained from Carbonatation and Phosphatation, are different. Sugars obtained from carbonated liquors present a lower colour than those from Phosphatation (Clarke et al., 1988).